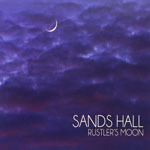 Share the post "Album review: SANDS HALL – Rustler’s Moon"
Better known as a writer, theatre director, and actor, Sands Hall has played the guitar since the age of 16, but it’s taken her until her sixties to release her first album. Inspired since an early age by Joan Baez, Judy Collins and Joni Mitchell it’s no surprise to find that Rustler’s Moon is a singer/songwriter album in that vein – songs very much to the fore, with suitably sparse accompaniment. The title track, with its slightly Spanish guitar style playing, is a beautifully delicate number, and opens the album in some style with some sympathetic dobro playing from brother in law Louis B Jones. And ‘Leanin Into The Bar’, which follows, is an equally engaging bluesy Vaya Con Dios style number. The album then heads off in a more avant guarde jazzy direction (very much as Mitchell herself did), making it less instantly accessible. Although it would be churlish not to mention the exquisite improvised saxophone playing of Randy McLean on ‘Chippewa Street’ and ‘The Stars Fell Down’. This entry was posted in ALBUM REVIEWS, ALBUM REVIEWS (Mobile), All Posts and tagged acoustic, album, jazz, review, Rustler's Moon, Sands Hall, singer, songwriter. Bookmark the permalink.